100 years ago communists met to found the Communist International. [See leftcom.org] The Congress drew together those who supported the working class revolutionary wave that had ended the First World War. We echo the words of Boris Reinstein, of the U.S. Socialist Labor Party: "... in our century there can be no wars that are not rooted in capitalist competition ... the proletariat not only does not have the duty, it does not even have the right to support its government, even in so-called defensive wars. There is only one war that the proletariat is duty-bound to support, and that is social war, the social revolution." The statement here has been drafted by the CWO in response to a request from a "No War but the Class War" meeting in January that was organised by the CWO and the Anarchist Communist Group (ACG). After discussion of the situation and how to chart a practical way forward, the meeting agreed to draft a statement which the attending organisations could support and publish in their press. The CWO was delegated to produce the first draft which we present here. It is self explanatory, applying the same approach as our former comrades adopted 100 years ago. Worldwide capitalism is in a long term and deepening crisis which is taking us down the road to generalised war. There are more than 60 local wars going on today. Every one of those destroys the lives of our working class sisters and brothers while different gangs of bosses struggle for control. Most of these wars are between the clients of the key imperialist powers. They are proxy imperialist wars which together with open trade wars are harbingers of a wider global conflict. The drive to war is an outcome of the operation of the capitalist system itself. It is not the result of a few mad or bad capitalist leaders and only the overthrow of the capitalist system can prevent war. The real alternative we face is war or revolution. Supporters of No War But the Class War (NWBCW) are aiming for the revolutionary overthrow of capitalism by the working class and the creation of a new global system of production. We are for a system based on common ownership to directly satisfy everyone’s needs. This will be controlled democratically by the working class via a global system of workers councils. Production for profit and the system of nation states and borders will be eliminated. In the process capitalism’s degradation of the planet will be reversed and humanity will be able to plan for sustainable development. To achieve this we need to organise ourselves on a global scale and spread the understanding of both the need to create a new society and consciousness of how to achieve it. The working class itself needs to create an international political organisation of revolutionaries for this task. The necessary starting point is to step up the defence of our own interests and reject ruling class agendas including the wars they ask us to support. All these wars are imperialist wars in the interests of sections of capital. NWBCW exists to oppose war on the basis of class, not just against one section of the ruling class but against the whole rotten system which offers the world's workers death, destruction and misery whether slowly by poverty, disease and disaster or at the faster tempo of war. Workers have no country! So-called “national liberation” or "anti-imperialist" wars are simply imperialist wars in disguise! We make no common front with any of the bosses' puppets on the capitalist Left like the parliamentary parties and trade unions and their hangers on in the pseudo-revolutionary swamp. They are all embedded in the bosses' system and support it in peace and in war. 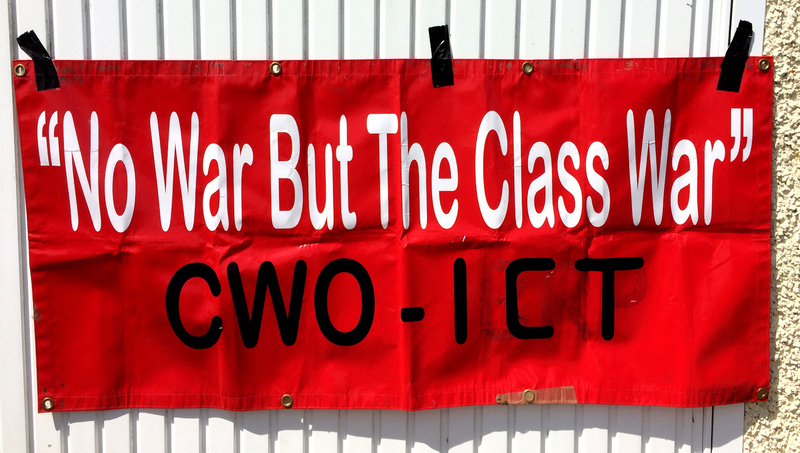 No War but Class War! Let us step up and generalise class struggle as our response to bourgeois war mongering and austerity! NWBCW is an organisation of groups and individuals who support the political positions above. We invite others who support these positions to join NWBCW to help us produce and distribute propaganda and carry out interventions in the class struggle for “No War But the Class War”.